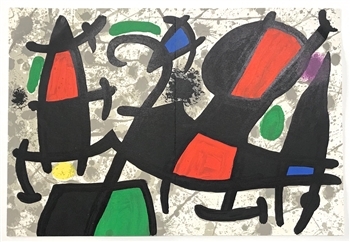 Medium: lithograph (after Miro). Executed for Derrière le Miroir (Sculptures -- no. 186) in 1970, and published in Paris by the incomparable Maeght atelier. As can be expected from Maeght and Derrière, the quality of this Miro lithograph is excellent. Sheet size: 15 x 22 inches (377 x 555 mm); with center fold and text on verso, as published. A richly inked impression. Not signed.